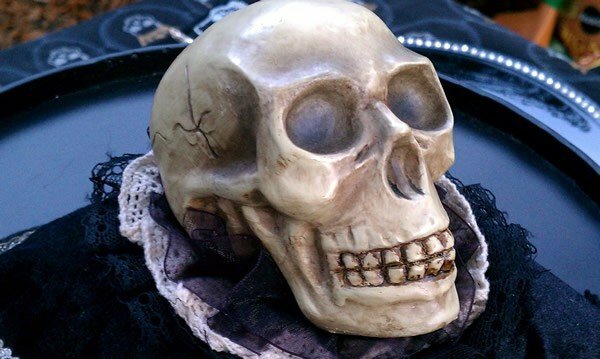 Today I wanted to give you an easy recipe to make for your Halloween dinner party. Cincinnati chili is similar to a regular meaty chili except it has unusual spices that you see more in pumpkin pie than an all-American stew. 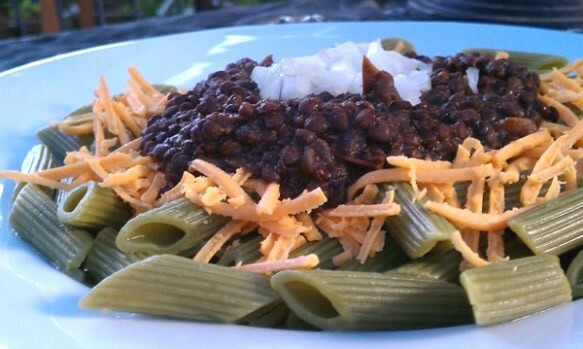 Traditionally, it’s a meat chili that has kidney beans as an optional topping along with shredded cheese and onions. Then oddly enough it’s served over pasta. This one uses vegan ground and the lentils for the meaty texture. The unusual spices blend in more than you expect, but there are Cincinnati chili lovers and haters. Because of the extra spices the ingredient list may look intimidating, but most things on the list are a quick measure and you’re done! 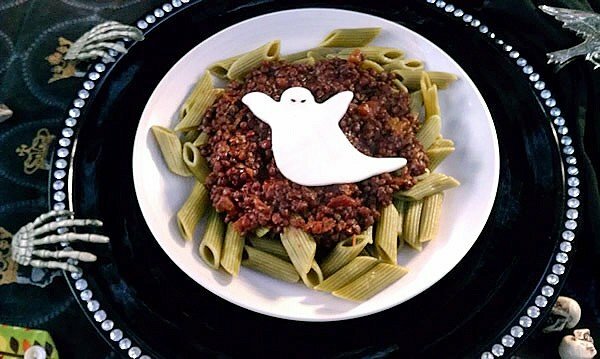 This looks especially spooky over spinach pasta, but it would work well over black forbidden rice too. 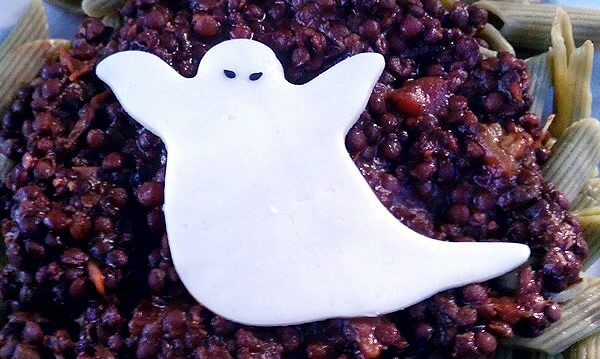 You can cut out ghost shapes out a slice of vegan cheese. Black sesame seeds or nigella seeds make great eyes! Add everything except nutmeg, salt and toppings to the slow cooker . Cook 7 - 9 hours on low. Add nutmeg, taste, and add salt or adjust other seasonings as needed. Serve over cooked pasta and top with your choice of onions and/or cheese. They are just black lentils. you could really substitute any lentil you have on hand. I just wanted the chili to look more ominous for Halloween. This is so adorable! I love the colors, and the ghost on top! I love the spices in this dish. very cool. I grew up on cincinnati chili and I’m a New Englander, believe it or not! Looks great! Your new book just arrived today and all the recipes sound delicious! New crock pot (Zisha) also arrived this week – very 60’s – 70’s looking orange but had the clay pot that I wanted! I’d like to skip the ground beefless. Could I just add extra lentils? Any suggestions? You can add cooked millet, quinoa, or bulgar in place of the lentils. I do not have a slow cooker, will it come out just as good if I simmer on top of stove in heavy pot? It sounds yummy, different than any chili I have had in the past, anxious to try it. It will work fine on your stove-top. You may end up adding a little more liquid as it cooks, but that’s about it. Let me know how you like it! I’m in Cincinnati native and grew up eating chili. This recipe was excellent! It was hardy and spicy like the real thing, but much healthier. Gold Star sells spice packets now. I doubled the recipe and added half of a packet. It pushed the chili over into the realm of authentic. I’m sure it could be done, but I have not made it in the IP yet, so I’m not sure of exact modifications. I’m assuming you mean on the pressure cooker setting, but did you mean the slow cooker setting? I love this recipe, and have made it several times. Do you have a Greek Spaghetti Slow Cooker recipe?